Complimenting your spouse daily helps keep the romance in your marriage. 1 How Often Should I Compliment My Girlfriend? Mark Twain said he could live on a compliment for two months. A good compliment is not just something that can make you feel better; a good compliment has the power to improve your marriage. Hara Estroff Marano, writing for "Psychology Today," notes that compliments help lighten up the mood between two people and helps them stay kindly disposed toward each other. When you compliment your spouse sincerely and frequently, not only do you put a smile on your lover's face, but you build stronger and happier marital ties. Develop awareness. Those who give the best compliments must first develop an awareness of the other person's gifts, talents, appearance, hard work and other things that play a part in an authentic compliment. Take note of the daily accomplishments, character traits and physical qualities you appreciate about your spouse. Material for a meaningful compliment abounds when you look for it. As a bonus: the more you look for good in your spouse, the less negativity you add to the marriage. Make it timely. Although almost any time is a good time to give a good compliment, sometimes it's better to hold your tongue. If you want something from your partner, your compliment can appear to be flattery at best and manipulative at worst. If your spouse is particularly frustrated with you or something else, a compliment can easily backfire. Include specifics. Don't stop your compliment at "Good job, honey" or "You look nice." Mention why it was a good job or why she looks nice. Dr. Trina Read, writing for "Hitched" magazine, suggests that women especially appreciate these kinds of details. For example, saying "That color in your dress brings out the blue in your eyes" encourages your wife more than saying "Nice dress." Men appreciate details, too. 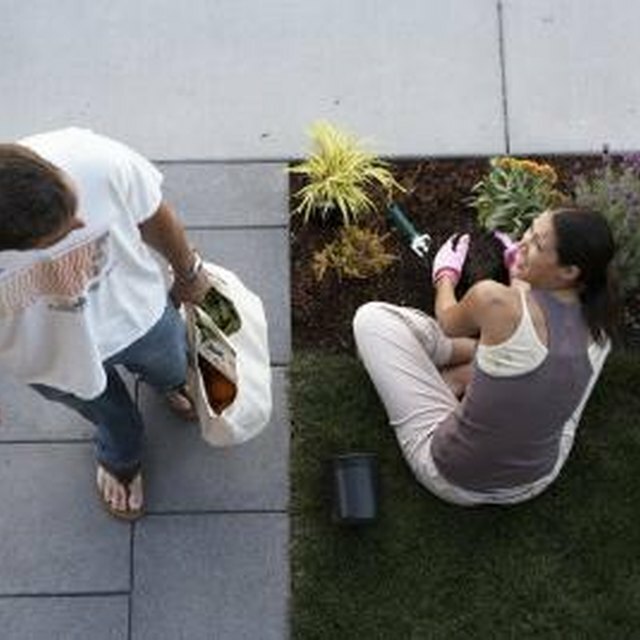 Rather than say, "The garden looks nice," smile and say, "I appreciate the hard work you do fertilizing and manicuring the lawn every week. Our garden is the best in the neighborhood." Add variety. To avoid a compliment-giving rut, try different types of compliments every week. Stronger Families -- a Washington-based non-profit -- notes that compliments can be divided into four categories. Possession, the first category, includes compliments such as "I like your earrings." These are the easiest compliments to deliver and are a great starting point.The next categories -- appearance, behavior and character -- take a little more thought as you learn to notice new haircuts, hard work and internal character qualities. Focus on intrinsic traits. When you really want to make an impact, compliment your spouse on his internal qualities you like the most -- such as personality, sense of humor or inner strength. When researchers Amie Gordon and Serena Chen conducted three experiments to determine which types of verbal affirmations made the most difference in romantic relationships, the intrinsic affirmations won. Your spouse may have difficulty believing or accepting a compliment -- even if it's true. Don't let that attitude deter you from future compliments. Be persistent and over time your spouse will likely appreciate your compliments and learn to thank you for your kind words. Beware of the back-handed compliment. Compliments such as "Your new hair color seems to cover your gray better" imply more negativity than positivity. Choose your wording carefully to avoid inadvertently disparaging rather than affirming your spouse.